For those who don't know a brief description of the 2 major quirks involved in the main story of My Hero Academia are the quirks One for All (All Might, Izuku) and All for One. All Might explains that One For All is the union of two Quirks: A Quirk that stockpiles power and a Quirk that could be transferred to others. One For All allows the user to access stockpiled power, which grants the user momentary superhuman strength at destructive levels, increased agility, and superhuman speed. Izuku Midoriya is the ninth user of One for All. All For One allows the user to steal other people's Quirks and wield these stolen powers as their own. All For One also allows the user to transfer stolen Quirks to other people. The user of All For One can combine several Quirks in order to create devastating techniques which would normally not be possible with the usage of only one Quirk. we see the combined effects of multiple quirks used together by All for one. Going by the name that is around 10-12 stolen offensive quirks (not to mention numerous defensive ones as well as ones allowing him to live etc. How is it that the combined physical prowess of 9 individuals (2 of which we know were quirkless) can be stronger than the combination of atleast a dozen Strong quirks, maybe more? Possibly Related: What does it mean that "One for all" allows to stockpile power? The accepted answer fails to explain how this stockpiling would outgrow All for one, unless its some sort of exponential increase for One for All vs a linear increase for All for One. Because All for One is adding powers on top of one another, while One for All is multiplicating it's strength. All for One is using the quirks of other users, I think he isn't the kind of person to go and master each and every one of those quirks. On the other hand, every users of One for All have been training the same quirk again and again, mastering it, and then passing their knowledge to their successors. I don't think the battle All for One vs One for All was a pure contest of strength, but also of mastery and technique. You can clearly see that when it comes to pure strength, All for One is stronger. But when it comes to ability, All Might was better. What made All-Might victorious was not his strength, but his ability to think ahead, and his near perfect mastery of One for All. 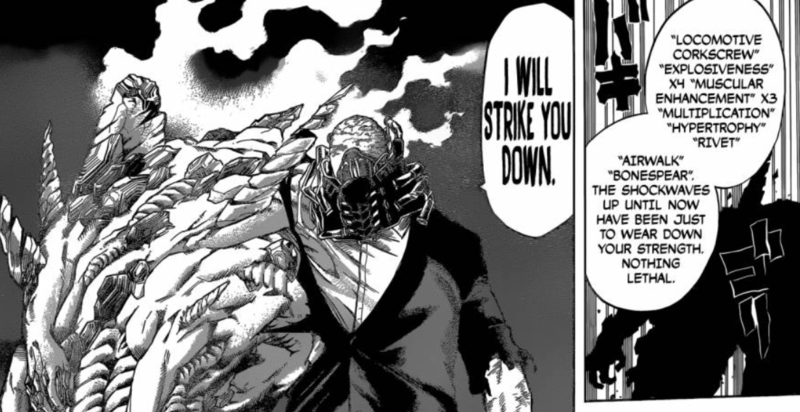 There's no reason to assume that the strength of AFO's techniques is a simple function of the number of quirks that he incorporates. Think of it like a recipe. Does a dish always get better and better as you add more and more ingredients? The answer is no. It only gets better if you add the right combinations of ingredients, and even then, there comes a point where adding more ingredients serves no purpose. Sometimes adding unneeded ingredients even makes the dish worse. Another point is that there are physical limits to how. An example was how Todoroki's body temperature dropped during his fight with Deku in the tournament. It is possible that AFO has similar limits. It need not be a contrived limit either such as some sort of "maximum" number of quirks he can marshal at once. It could be the case that he just doesn't have the mental capacity to keep track of all of the quirks he can possibly use at once.